Kauai is called the Garden Island of Hawaii for good reason. Rent a budget timeshare here and plan your 2010 family vacation to the most beautiful of all of the Hawaiian Islands. At just 10 square miles you can rent timeshares anywhere on the island and still have easy access to all there is to see and do. First-time and frequent visitors alike all have the same reaction to Kauai - "How can so much beauty be found in one place?" On Kauai the best tourist-attractions are those created by Mother Nature herself. In order to travel about the island, renting a car is the best suggestion. There are bus tours available, although your choices of sightseeing stops are limited, of course. You'll also find many opportunities for walking tours and hiking, as well as sightseeing by boat and even helicopter. The Alakai Wilderness Preserve is a natural preserve of bog land. Located on a plateau, this wetlands area is created by its proximity to Mount Wai'ale'ale, one of the wettest places on earth. Here you can hike the mist-shrouded Alakai Wilderness Trail through a unique ecosystem where you'll discover rare plants and birds. If you manage the entire 3.5 miles, the lookout at the end of the trail will reward you with a spectacular view of famous Hanalei Bay in the distance, the sight of several sparkling waterfalls, and a chance to actually walk through clouds. Breathtaking Wiamea Canyon is known as the "Grand Canyon of the Pacific," so called because the vistas of this 3,000 ft. deep canyon go on for miles, reminding many of the panoramic views Arizona's Grand Canyon. The main road is easy to drive and will take you to several lookouts, ending at Kokee State Park. Many hiking trails, appropriate for both beginners and advanced hikers, will take you further into the magnificent interior. The awe-inspiring views of the incredible Napali Coast along Kauai's North Shore can be enjoyed by hiking along the Kalalau Trail, an 11-mile trail that crosses five different valleys and ends at secluded Kalalau Beach. Be warned that this challenging and sometimes dangerous trail is best undertaken by advanced hikers, and taking a trail guide is encouraged. Many hikers break the trail up into two days, setting up camp on the beach at Hanakapiai. Zodiac boat tours and kayaking trips will also provide you with gorgeous views of the Napali Coast. 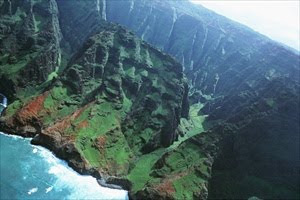 And for an especially fun experience take a helicopter tour to see enchanting scenic Napali areas not accessible by land or water.